So after yesterday's prelude, let's dive into the box from Jaybarkerfan's Junk Wes. 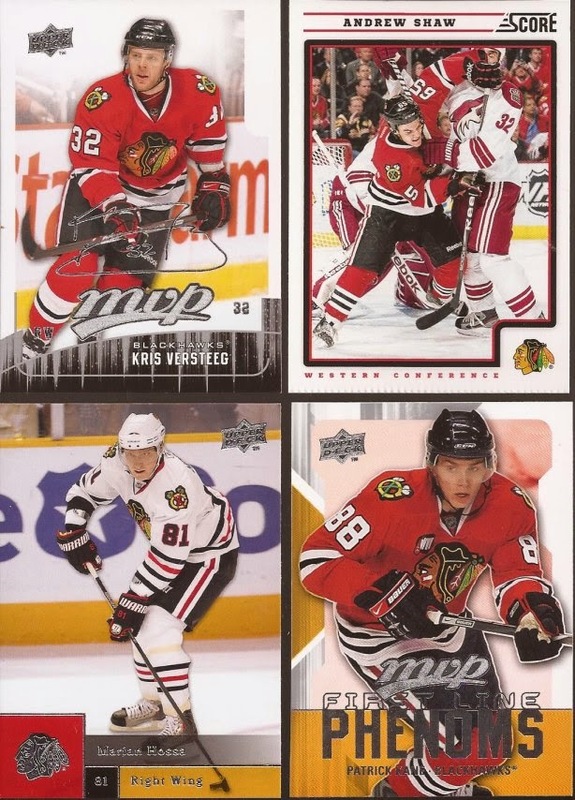 After organizing the load of cardboard I received, I've decided to start with posting the Blackhawks cards within. All total, Wes sent 27 Hawks cards. I won't scan and post them all, but I will do my best to show a representative of what he dropped here. Let's start with some junk wax Bowman. Whether hockey or baseball, this was never a good looking set. But you do have some stars in Belfour and Roenick, and current Hawk's radio color man Murray. Some more junk wax, this time from Score. More Roenick and Belfour, but Gilbert was pretty much a waste in a Hawks sweater. Grandpa sighting!! Larmer should be in the Hall Of Fame. Great view of the Blues old uniforms on that Barker. Thank goodness they brought them back. The first Russian to get on the Hawks in the early 90s invasion from the Soviets was Krivokrasov. Lot of speed but not much else. I thought Wes was mistaken with that Lang, but the word mark is Blackhawks, so I realize he is trolling me the way I troll Night Owl with not Dodger Dodger cards. Best part of forgetting about Lang was a Hawk is that when we traded him away, we flipped the draft pick received into two other draft picks - one of those became Brandon Saad. Hawks win again. Speaking of Saad, here's 4 others with their name on the Cup at least once. Love that Kaner. Here at the best two base. I really REALLY need to buy a couple boxes of UD Masterpieces. I keep saying it and never pull the trigger. 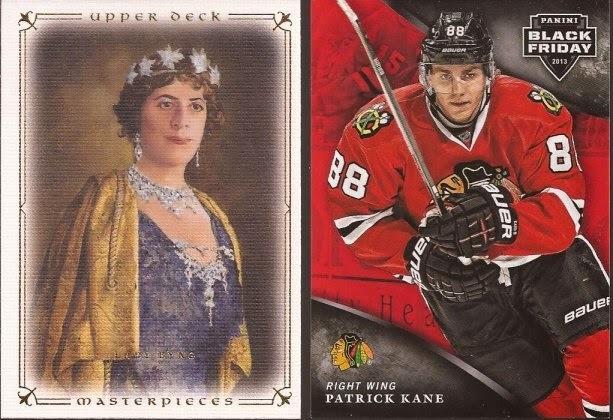 For a Panini card, the Kane looks good. Finally, here are the three relics of the Hawks. I was going to keep these with the other relics to post later, but let's keep the hockey together. Sullivan was a decent player to carry the Hawks until Kane and Toews arrived. Danny Richmond had a very unremarkable career with the Hawks, yet he has a ring from 2010. T-Bo..... boy. He had a few decent years, but never became the savior between the pipes. Great relics for the binder. One post down; a bunch to go. LET'S GO RED WINGS! If you decide you don't want the Danny Richmond in the future I'll happily take it off your hands the next time we trade. Good luck getting everything posted! I'd never think of 91-92 Score for great photography, but that Gilbert (and the much later Shaw) nicely captures the many scrums that take place during the game.